Location: St. Paul's Church & Community Halls, Maybury 2, Oriental Road, Woking, GU22 7BD opposite Lion Retail Park (Asda, Currys, Hobby Craft). Learn flowing movements and exercises for relaxation, health and well-being. 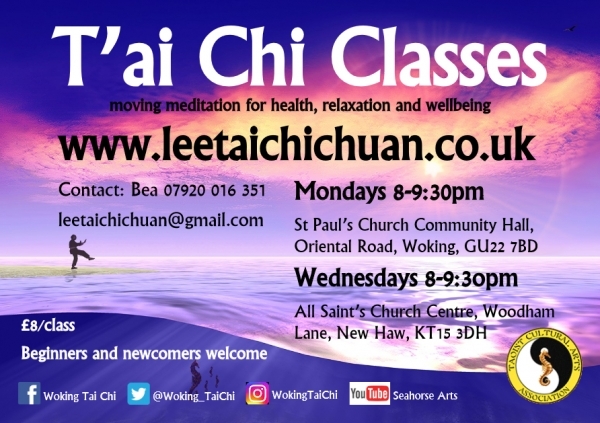 Classes involve a variety of exercises, starting with a gentle warm up of the joints, breathing exercises such as Kai Men and Tao Yin, practice of sequences of movements such as the Lee style Tai Chi Dance and Form. It also involves a few interactive activities such as sticky hands which promotes self-awareness and awareness of others. This is a soft or internal style of kung fu which means that there is no blocking or hard physical contact. Instead you can learn to neutralise the attacking force by turning it back upon itself. This means training your sensitivity so that you can learn to read someone's intentions even before they make a move. This kind of exercise depends upon relaxation rather than tension or physical muscular development. Lightness, flexibility and technique are emphasised and everyone is encouraged to train with a spirit of friendly co-operation rather than competitiveness. It involves learning to deal with punches, kicks or grapplers using a wide range of responses, but it is based purely on practical self defence skills which are unsuitable for use in competitions or as a sport. Both Lee style Tai Chi and Feng Shou Kung Fu is a balanced Yin-Yang style as taught by Master Chee Soo in the UK. I have been teaching Tai Chi for over 10 years and with regular practice I have seen my overall health; both physically and mentally improve immeasurably over this time. I am part of the Taoist Cultural Arts Association who have teachers nationwide. Beginners and newcomers are welcome to start at any time. Lee Style Tai Chi is a form of moving meditation which benefits both the body and mind. Based on the principles of Taoist philosophy the exercises are purposely slow and relaxed to promote health, long life and mental focus. 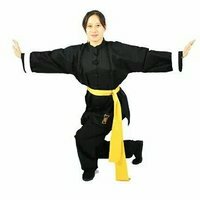 Feng Shou kung fu is a soft or internal style of kung fu which means that no blocking or hard physical contact used. Instead techniques are learned to neutralise the attacking force by turning it back upon itself. This means training your natural sensitivity so that you can learn to read someone's intentions and avoid competition. Classes are TBC, please contact me if you're interested.